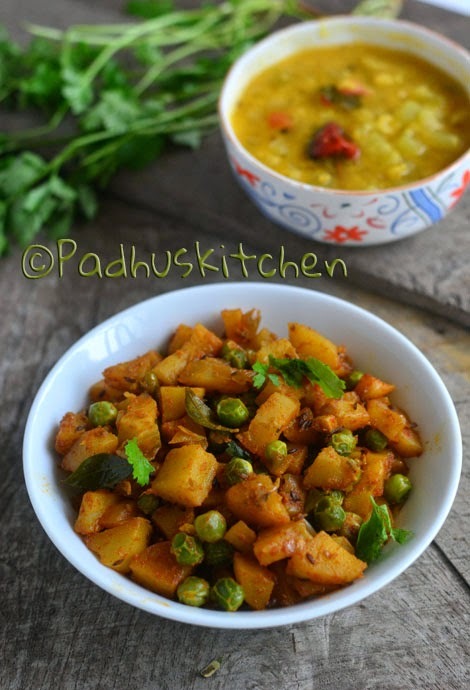 Aloo Matar dry curry/Aloo Mutter Sukhi Sabzi is a dry dish prepared with potatoes and green peas. It is very simple to prepare and goes well with rice and all Indian breads. This sabji is loved by people of all age groups. Today we will learn how to make Potato peas dry curry following this easy recipe. Wash, peel the skin and chop potatoes into cubes. Cook peas with a little salt until tender. You can use frozen peas also. Heat oil , add cumin seeds, when it splutters, add chopped onions and curry leaves. Saute onions until transparent. Then add cubed potatoes, turmeric powder and cook covered on medium flame stirring now and then. Sprinkle water in between. Once the potatoes are half cooked, add salt needed, coriander powder, chilli powder, garam masala powder and cook covered until potatoes become tender. Add peas and cook for another 5 minutes until everything gets blended well with the spice powder. Remove from heat, garnish with coriander leaves and serve delicious dry aloo matar curry with hot rice, rotis or parathas. I personally love it with dal and hot rice topped with a tsp of ghee. Note - If preferred, you can add 1/4 tsp of amchur powder or dry mango powder along with the spice powder. Do not miss my the most popular Aloo Matar Gravy recipe with step wise pictures. Click the picture below to take you to that page. Do not miss my lovely collection of more than 50 Side Dish For Chapati. wow Padhu, wat a spicy n colorful click...This tastes divine with hot onion sambar. alloo mattar my favorite one.very easy and best with chapati even with bread too..nicely presentaed padhu..what a lovely flowers..
Nice curry and cute flowers! My favourite combo, just love with rasam or with rotis, yumm!makes me hungry..
Aloo Mutter curry tastes very good with curd rice...Nice aloo flowers. simply yum yum..all time fav...i make the same way with same ingredients...its the best side dish to have with hot phulkas...nice colour in ur aalo matar.. Yummy!!! Goes great with Hot Hot Roti's!! !Love that Potato flowers!!!! Very tempting alu mutter. Loved the potato flowers,very creative. yummy n lovely dish..as usual nice click! I like the masala you have there, makes it flavorful. Perfect Bhaji for Poori I bet. Wonderful presentation. One of my favourite dish. Looks delicious and tempting. Padhu, I don't know anyone who doesn't love a 'tato : ) And even though my hubby doesn't care for peas, he would hardly keep me from making this. Thank you for your fine MLLA recipe! aloo matar looks awesome.as usual the veg carvings are great. Delicious dish which kids(and adults) will surely love!! U have made me hungry again after a heavy meal I had just a few mins ago. It looks good! Simple and tasty dish very lovely presentation. can we do this recipe without amchur powder? Yes Meraj, you can prepare this recipe even without amchur powder. 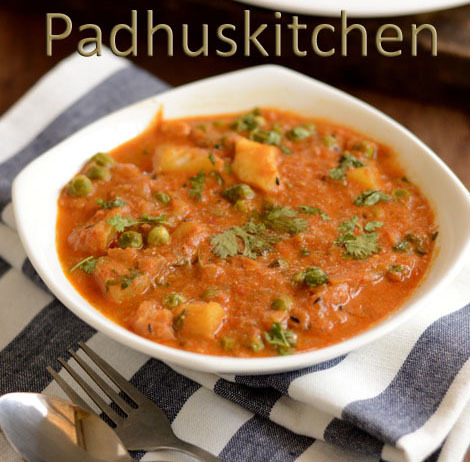 padhu,reaally its awesome,i tried it,it came out very well..
Padhu Mam - Awesome post. Very detailed . I tried it and it came out well.